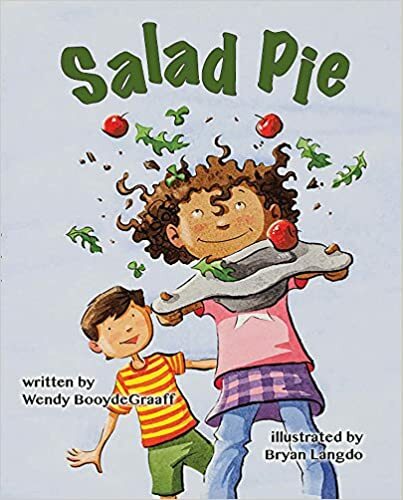 Salad Pie is about a girl named Maggie. She went to the park and wanted to use her hat to make a salad pie. She doesn’t really make a pie. She uses her imagination. Then her friend, Herbert, comes along and he kind of messes up the salad pie. In the end, he helps make it and it is kind of perfect. I like that she is using her imagination. I also like that this is about being a friend.Sometimes, things don’t go just like you want, but with your friends, you can do something better. I am going to give my copy to my teacher because I think this is a good book for my class. We can all be better friends and also use our imagination more. Tomorrow, come back to learn about the author. Friends add variety to our lives. I agree, Rachel. Thanks for stopping by.